“First they came …” is a statement and poem written by Pastor Martin Niemoller (1892- 1984) about the cowardice of German intellectuals following the Nazi’ rise to power and subsequent purging of their chosen targets, group after group. Many variations and adaptations in the spirit of the original have been published in the English language. It deals with themes of persecution, guilt and responsibility. ….. Wikipedia. 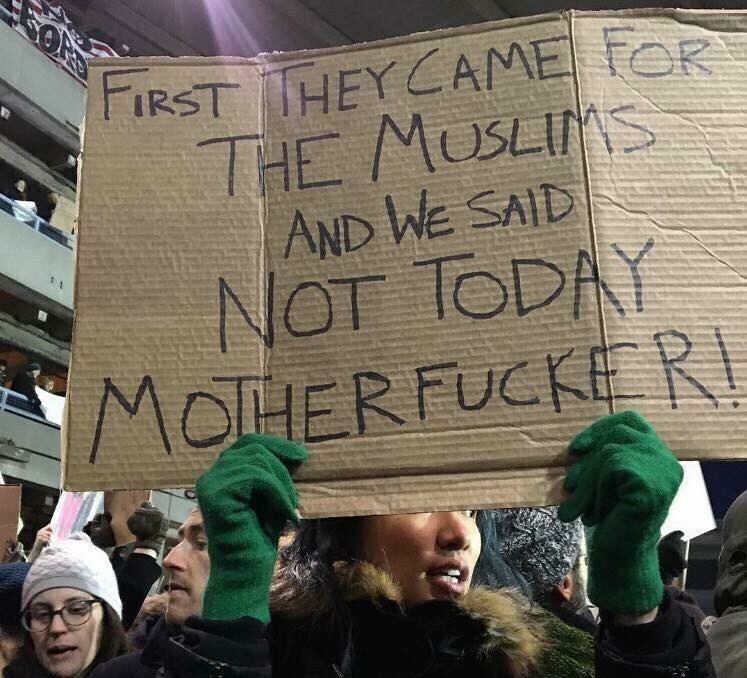 The above image, a response to Donald Trump’s targeting of Muslims is enough to make us wonder is history about to repeat itself. Let’s hope not. FIRST THEY CAME FOR THE SOCIALISTS, AND I DID NOT SPEAK OUT…… BECAUSE I AM NOT A SOCIALIST. THEN THEY CAME FOR THE TRADE UNIONISTS, AND I DID NOT SPEAK OUT…….. BECAUSE I WAS NOT A TRADE UNIONIST. THEN THEY CAME FOR THE JEWS, AND I DID NOT SPEAK OUT…………… BECAUSE I WAS NOT A JEW. THEN THEY CAME FOR ME —– AND THERE WAS NO ONE LEFT TO SPEAK FOR ME. The recent performance of the Irish Celtic Band Lunasa At the Key City Theatre in Cranbrook should have been an eye (ear) opener for local audiences. I am sure it is the first time that a Uilleann Piper has graced a local stage. Cillian Vallely playing that curious collection of Irish plumbing certainly gave Lunasa a very distinctive sound and his solo piece was, for me, the highlight of the evening. This is a uniquely Irish instrument that as a Celtic mood instrument has replaced the highland bagpipes. It is not unusual in movies these days when the story line involves the highlands it is the Irish Uilleann that you will hear on the sound track providing the appropriate mystical mood. So it would seem appropriate to have a look at tutorial video to get some idea of how the instrument works. Also here are also some performances on an instrument that has since the early 60s has gone from strength to strength. I remember in the mid 60s pipers traveling to Ireland to literally sleep on the floor to study at the feet of the great masters who were still alive. Here are some more recent performances. First off there is the Scotsman Fred Morrison who is also a master Highland piper, whistle, small pipes, etc, etc. .
Catherine Ashcroft playing a slow tune that only bagpipes can bring us to a high emotional state. She follows the slow piece with a tour de force on the KING OF THE PIPERS. What I find fascinating is how full the sound can be with all the drones going and various registers that can be heard when Catherine drops her wrist onto the registers. Also Maurice Dickson percussion and guitar accompaniments are more than note wothy. Celtic guitarists seem to have a lock on how to play rhythm guitar. Just in case it is thought that only traditional Irish Music can be played on Uilleann pipes here is a classical piece by Handel.